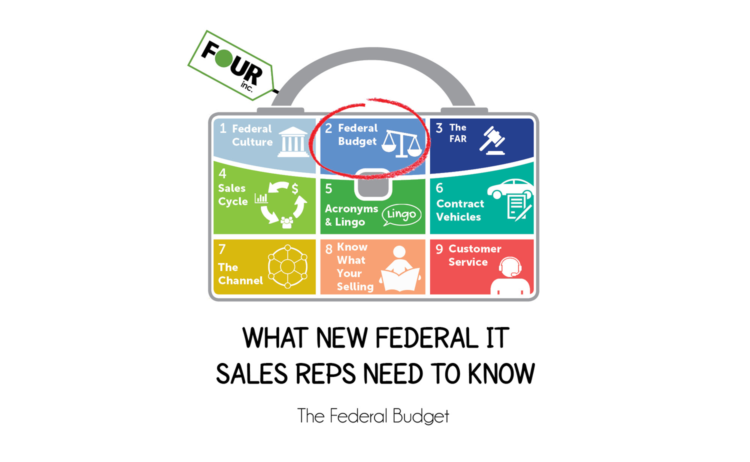 What New Federal IT Sales Reps Need to Know: The Federal Budget - Four Inc. The federal government’s budget is big. Really big. So big that it takes up 20% of the economy. As a federal sales rep, it’s vital to understand where those federal dollars are spent and how it could affect your sales cycle. In a nutshell, the federal budget is an estimate of how much money the government plans to make and spend every fiscal year. The federal budget originates in the Executive Branch and the White House. Each year, the President submits a “sample budget” which outlines executive requests and the overall direction of the fiscal future for the upcoming year. This is a very top-heavy step in the formation process. The goal here is to arrange a wish list comprised of mandatory vs. discretionary spending, and interest on debt. Mandatory and discretionary spending account for more than ninety percent of all federal spending, and pay for all of the government services and programs on which we rely. However, the federal budget process technically doesn’t start at the White House. The fiscal year (FY) planning begins a year and a half prior with the Office of Management and Budget (OMB). OMB and the White House review individual agency requests and attempt to fit those requests into general spending goals approved by the President. Often times, agency requests can’t be fulfilled and therefore the agency must submit an appeal. 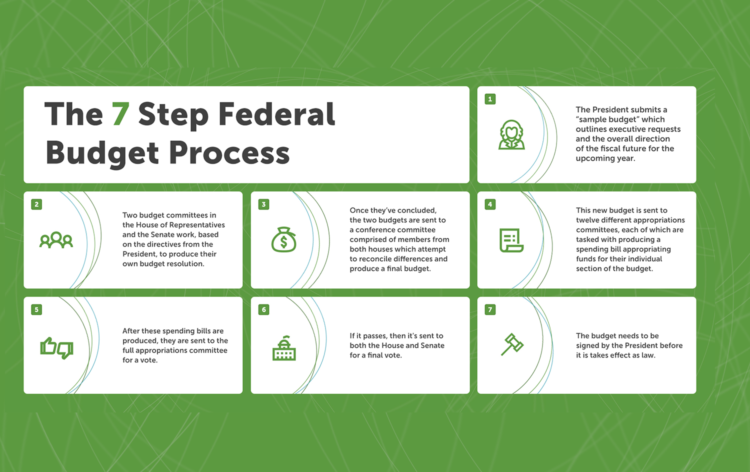 This lengthy process comprises a majority of the time it takes to formulate the federal budget. After the Executive branch has completed preparing the federal budget, Congress becomes involved and the budget has the ability to change substantially. The two budget committees in the House of Representatives and the Senate work based on the directives from the President. Once they’ve concluded, the two budgets are sent to a conference committee comprised of members from both houses which attempt to reconcile differences and produce a final budget. This new budget, still based on the wishes of the executive branch, is sent to twelve different appropriations committees, each of which are tasked with producing a spending bill appropriating funds for their individual section of the budget. After these spending bills are produced, they are sent to the full appropriations committee for a vote and then the entire body of both the House and Senate for a final vote. Tired yet? So are we. At this point, it’s clear that with so many stages of review, there will always be some deviation from the budget originally outlined by the Executive branch and OMB. After all this, the budget still needs to be signed by the President before it is takes effect as law. WHAT HAPPENS IF THE FEDERAL BUDGET DOESN’T GET APPROVED? You’ve heard it all before: government shutdowns, political gridlock, even something called a Continuing Resolution. While we trust that congressional deliberation or executive action has positive intent, the debates on future federal spending don’t always meet budget deadlines. As a result, Congress may pass a Continuing Resolution which funds existing agency obligations until an agreement on a new budget is reached. These Continuing Resolutions may be one of the biggest obstacles to your sales cycle as Contracting Officers won’t know how much to spend for the upcoming fiscal year. It goes without saying that if your Contracting Officer doesn’t have a budget, they won’t know where they can spend or cut back. If the budget or Continuing Resolution isn’t passed and signed, then existing obligations would go unpaid and future appropriations wouldn’t exist. At this point the government would shut down and only fund essential projects and personnel. The budget process certainly serves as a formidable obstacle if things go wrong, but there is a silver lining to it all: a commitment to modernization. In recent years, the government has shown a commitment to continually modernize existing systems and IT capabilities. A modernization focus is one that has been consistent for both of the recent presidential administrations; this proves that it is a major goal of the government and will continue to be well into the future. That’s great for IT sales folks! First, the Obama administration used the executive budget to allocate over three billion dollars to replacing aging networks. Then, the Trump administration has advanced the objective with the Modernizing Government Technology Act. This act sets aside a devoted source of funding to help agencies transition to the cloud, implement shared services, and enhance cyber defense capabilities. WHAT DOES ALL OF THIS TECHNICAL BUDGET STUFF MEAN FOR YOU AND YOUR COMMISSIONS CHECK? To put it simply, for a federal IT sales representative, knowing the ins-and-outs of the federal budget can help you make a sale, even when the customer “technically” doesn’t have the money to pay for it. The budget is out there….it is public information. Budget information is publicly accessible and just a few clicks away online, use it to your advantage! The White House and Office of Management and Budget typically post a massive document online which contains the budget priorities of the current administration, summary tables, analytical perspectives and more. Here is the Budget Document for the Fiscal Year 2019. Take some time to research the major areas of spend, specifically within IT. Determine where the government is allocating its “modernization” dollars, as mentioned above. Is it in Cyber? Where in Cyber? Data Analytics? Once you determine the major focus areas – you can use this information to target your sales efforts and frame your discussions with customers. If you are selling something in these areas, great – if not, think about how your product interacts with these initiatives and strategize from there. What do you do if you are in a budget freeze situation or Continuing Resolution, but you have a customer that wants your technology? Now that you have read our blog and understand what Continuing Resolution means and how it happens – you can talk knowledgeably with your customers about alternatives. You can explore a payment plan or a usage-model with your customer. These solutions enable customers to acquire technology NOW, by leveraging a small portion of its budget. That’s a win for them and for you. Federal IT sales is not easy – making a technical sale is tough enough……and when you throw government funding and budget issues into the mix it becomes increasingly more difficult! Do your homework and think of creative procurement models along the way. Knowledge of your sales landscape and preparation are keys to your success. Let Four Inc. know if we can help you get your customer to “Yes”!